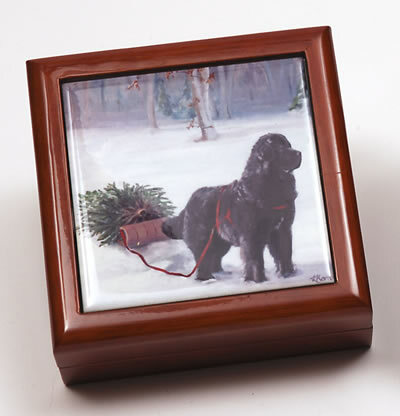 The Black Paw Studio Solid Wood Keepsake Box with image of a Newf Hauling a Christmas Tree by Lisa Kovvuri. The image is on a 4.25" square ceramic tile. Made of solid hardwood with a high-gloss mahogany lacquer finish, the box has a velvet-lined interior and a felt-covered bottom.